The Renaissance Garden Foundation is asking for volunteers or interested groups to help achieve the vision of a botanical garden in Hiller Park, one of the city’s most popular and spacious parks. The garden, which is on the eastern side of the 99-acre city park, would be for the propagation and cultivation of specimens of plants, flowers, and fruit and forest trees. And, says spokesperson Martha Boyce, the garden would be for the promotion of science and knowledge. 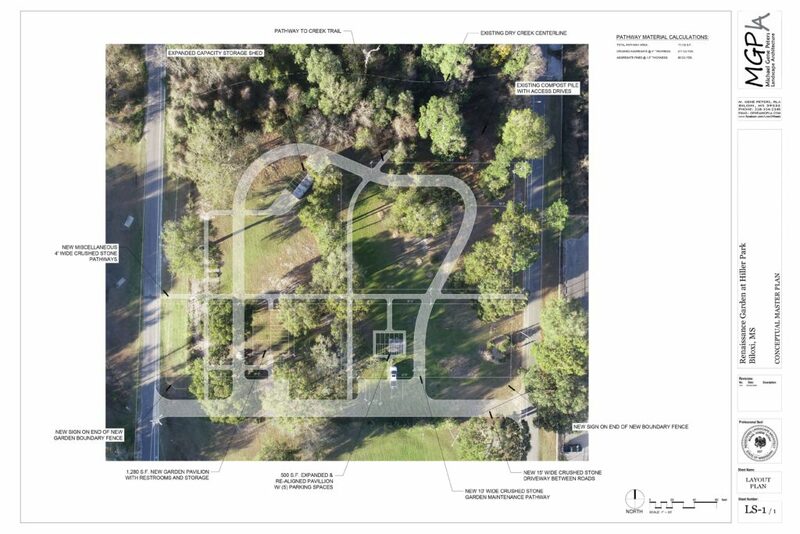 Boyce, who has worked toward establishing the garden for years, says the site would be managed and maintained by members of the Renaissance Garden Foundation with the assistance of the City’s Parks and Recreational Department. Those interested can learn about volunteering with the Renaissance Garden Foundation by contacting the foundation’s Executive Director Mrs. Martha Boyce at 228-365-9293. The Renaissance Garden came to life in 2006, in the dreary days of the early recovery from Hurricane Katrina. However, the effort has recently sought an infusion of new volunteers with an interest in gardening. The diagram shows an architectural sketch of the future infrastructure to support the Renaissance Garden at Hiller Park.